Solar P.V. rooftop systems are used to generate electricity at warehouses. Warehouses typically make ideal solar installation candidates since they often have large, unobstructed flat roofs. Large roofs enable large P.V. systems that generate more electricity. Solar P.V. installations are entitled to 30% tax credit or now for the first time a 30% grant . When using either the credit or the grant, five years MACRS deprecation is available. 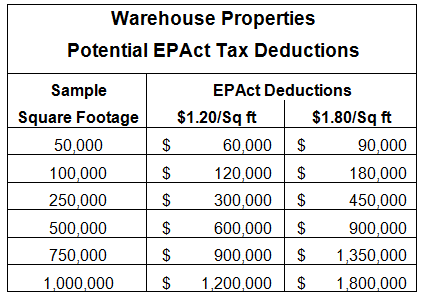 Often tax equity partners will be willing to make the investment for a rooftop warehouse solar installation and enter into a power purchase agreement where the warehouse operator post-installation will purchase its electricity at an agreed price for a fixed period of time, usually 15 to 20 years. The tax equity partner will use a combination of the power purchase agreement annual revenue, the tax credit or grant, utility rebates if available, green tag emission payments and net metering electricity payments for selling the excess power back to the grid to generate an acceptable economic return. With a power purchase agreement, a warehouse is essentially renting its roof as an alternate energy electrical generator. 1. Assemble team including Warehouse experts for EPAct tax incentives, utility rebates, lighting, heater, envelope and solar. 2. See if roof is compatible for solar and heater. Obtain solar and any needed roof/insulation proposals. 3. Obtain lighting design that replaces all inefficient lighting. Compare and contrast fluorescent, induction and LED lighting alternatives. 4. Obtain Cambridge heater or equivalent design proposal based on proposed roof design. 5. Determine utility rebate based on all proposed separate and combined measures. Lighting will reduce electrical use. Roof, insulation and heater will reduce therms. 6. Determine tax incentives including EPAct tax deduction benefit and solar credit tax deductions. EPAct will be based on total project square footage, including mezzanines and pick and pack modules. The 30% solar tax credit will be based on the combined solar material and installation costs. 7. Prepare project proposal integrating project cost, energy savings, utility rebates and tax incentives. 10. Have EPAct modeler and tax expert prepare IRS approved software model and tax documentation. 12. Reduce Federal and State estimated tax payments for large tax deductions and credits. 13. Celebrate tax enhanced energy efficient warehouse achievement. As described above there are multiple compelling reasons including energy and substantial tax savings why warehouses are becoming the breakout energy efficiency project building category. This is such a widespread phenomenon that market forces will require warehouse landlords to upgrade just to remain competitive. Once the overwhelming majority of warehouses are upgraded America's building products community will undoubtedly turn their attention to the next major building category requiring improvement which may very well be the office building you are sitting in. Charles Goulding, Attorney/CPA is the President of Energy Tax Savers, Inc., an interdisciplinary tax and engineering firm that specializes in the energy-efficient aspects of buildings. Jacob Goldman, LEED AP, is and Engineer and Tax Consultant with Energy Tax Savers, Inc.
Joseph Most is an Analyst with Energy Tax Savers, Inc.
See Charles Goulding, Jacob Goldman and Taylor Goulding, Tax Planning for the 21st Solar Century, Corp. Bus. Tax’n Monthly, February 2009, at 23.